This year marked the first time that the International Builders Show (IBS) and the Kitchen and Bath Industry Show (K/BIS) were to be held during the same week and at the same venue. Las Vegas welcomed both shows with open arms and it was dubbed Design Construction Week. IBS is a much larger show with close to 80,000 attendees while K/BIS is about 10,000 but both shows benefited from new visitors whether they be contractors, builders or retailers. The energy at IBS was much higher than the last show I attended in Orlando and speaking with the exhibitors they were busy for 3 full days. 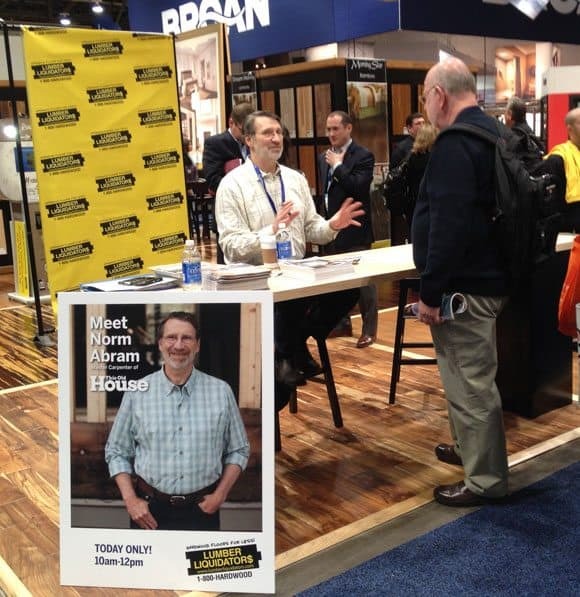 The aisles were packed and sometimes tough to negotiate and there seemed to be much more media walking around as well as celebrities like Norm Abram from This Old House to Vanilla Ice from HGTV and the DIY Network. This year Clopay garage doors sponsored our trip to IBS and we are grateful for their support. They’ve always been a great partner and we had the pleasure of touring their plant in Ohio a couple years ago. We’ve also gone through the installation process of their Gallery Collection door which has performed flawlessly. It’s tough to compile a list of best new products especially when I undoubtedly missed a few, but there were plenty of great products that I saw to choose from. Laufen introduced a thinner yet more durable ceramic that allows greater creativity in design. It’s called SaphirKeramik that includes the mineral corundum, which occurs in nature as a component of sapphire. This mineral is also used in the watch industry as sapphire glass dials and its hardness is only surpassed by that of diamonds. Marvin continues to innovate and by introducing their new interior window shades. These shades can be opened from top or bottom and are available in a variety of opacities and colors. These interior shades are integrated into Marvin windows and sliding doors and can be retrofitted into existing Marvin windows and sliding doors. Their exterior shades are also amazing! Trex has introduced landscape lighting that will not only compliment their decks but also the rest of your lawn and yard. Trex Landscape Lighting options feature compact designs that put the focus on the fixture’s effect instead of the source, and may be built into new or existing outdoor living spaces. Kohler’s lighted hinge toilet seat offers soft alternative to overhead lighting. The new Nightlight seat features a lighted hinge, illuminating the toilet space sufficiently to allow homeowners to leave the overhead lights off while using the bathroom at night – creating a soft ambiance in comparison to overhead lights. Nightlight casts enough light to allow homeowners easy use of the bathroom space. Clopay has introduced a black steel garage door. Black has become a much more popular design color and Clopay is responding to the recent trend towards a more glamorous look . Black garage doors have long suffered from an issue with heat that can cause the door to warp or disfigure but Clopay’s innovative cool paint technology ensures that the garage door doesn’t retain the same amount of heat as black doors once did. The black door is available in their gallery collection vintage style grooved panel steel door as well as their classic raised panel steel door. Gladiator GarageWorks introduced their Sport Lockers at IBS this year. They are geared towards young (and old) athletes that crave their own lockers like their favorites and for the parents that appreciate a well-organized space for sports equipment. These sport lockers will be available in various college team colors. Ideal for the garage, basement or home gym, these durable lockers provide the same type of organization space as today’s top college student-athletes. They also just look much cooler in your garage. The photo and video say it all. Ladies and gentleman the Autohoop hiding basketball hoop. Perfect for those pesky HOA’s and those who prefer a cleaner look to the front or side of their home. There were plenty of wine storage companies on display at IBS and K/BIS but the one that caught my eye was from vin de garde. Their innovative wine storage solution can be configured in a variety of ways and all of them are elegant and unobtrusive and some are even DIY friendly. The smart and connected home continues to be a driving theme and there were apps for everything! From fireplace controls to garage door openers. Hot on the heals of the Nest, manufacturers are realizing that homeowners want more from their thermostats and Honeywell seeks to deliver with their new lineup of talking thermostats. Using natural language you can speak to your thermostat and tell it your preferences and it will set a program to fit your lifestyle. While not as elegant as Nest (what product is? ), Honeywell is moving in the right direction. Honorable mention goes to Sherwin-Williams for introducing Color Snap Glass, the first Google Glass app from a major consumer brand. Color Snap Glass allows you to take photos using your Google Glass and overlay different colors and can be used as a design tool. Once you’ve selected your color, the app will direct you to the closest Sherwin-Williams store. We’ve shared more than 100 photos on our Facebook and Google+ pages and you can also view our IBS slideshow and K/BIS slideshow. We look forward to attending next years show and if we missed out on any amazing products please let us know in the comments.